Over the last decade, technology has taken the absolute forefront in shaping our societies. Communications technology and computer technology (cellular telephones, email, the internet, etc) have forever altered the way in which we conduct business and live our lives. The exciting end result is that we can now more easily and effectively connect to each other than any of us could possibly have imagined. Unfortunately, however, our lives have also changed in other ways. Stress and conflict in the workplace has soared in the last ten years. Customer behavior seems to be getting worse with each passing day. Fundamental etiquette, and what used to be called ‘common courtesy,’ is changing from being the norm to being quaint and idealistic. Somehow, somewhere along the line, as we were learning how to connect to each other, we started forgetting how to connect with each other. So what is the secret to connecting with people? What is the element that seems to be eluding us? 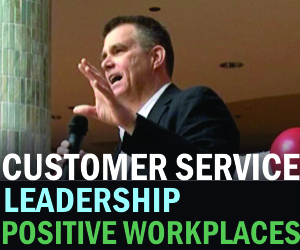 What is it that companies are missing in their efforts to provide world-class customer service, and managers are missing in their efforts to build a loyal, motivated workforce? The answer is as simple as it is elegant. It’s the timeless rule of getting along with people we were taught as children: The more you care about the people around you, the stronger your relationships will be. Think about it. Think about the last time you, as a customer, had an unpleasant experience with a company. What was the overriding message you got from the company that made the experience so unpleasant? It was that you, the customer, didn’t matter. They didn’t care about you. What is the number one complaint that employees have of bad bosses? It’s that their bosses treat them as though they are unimportant. What is the number one complaint that bosses have of unpleasant employees? It’s the sense that these employees don’t care about them, the company or their coworkers. After 15 years of researching customer service, leadership, teamwork and conflict management, I can state unequivocally that your ability to connect with another human being is directly proportional to the degree to which that person thinks you care about them. So what does this mean? Well, for starters it means that, if you want to work with people, you actually have to really care about other people. You have to want them to be happy, and you have to be prepared to occasionally put their needs ahead of yours. For companies that want better customer relations and better customer loyalty, it means that every aspect of your company has to send the consistent message, “we care about you” and “you’re important to me.” It means that the time has come to stop dehumanizing customer’s experiences. Cute automated telephone systems, for example, that try and mimic a human experience only reinforce the message that you’re too big to actually care about your customers one-on-one. Customers want to deal with competent, confident, compassionate and cheerful people who are empowered to do the right things. – not machines which have none of those qualities. You want to build greater employee loyalty? Send them the same message. Let them know in your words and actions that they are important to you and that you appreciate their efforts. The same rules hold true for individuals who are looking to create more positive relationships, build stronger networks, generate greater sales, or improve the workplace environment. There are veritable mountains of research telling us that people everywhere – customers, employees and employers – just want to be associated with people and businesses that care about them. If you truly believe the old adages, “what goes around comes around,” and “you get what you give,” then live by them. The concept of caring about other people is simple, but not nearly practiced as often as we might want to believe. Don’t just talk about it – do it.